Not to be confused with Halki in the Dodecanese. 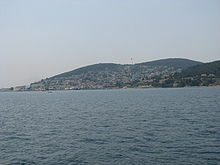 Heybeliada or Heybeli Ada (Greek: Χάλκη, Halki) is the second largest of the Prince Islands in the Sea of Marmara, near Istanbul. It is officially a neighborhood in the Adalar district of Istanbul, Turkey. The large Naval Cadet School overlooks the jetty to the left as you get off the ferry or seabus. There are two interesting pieces of architecture on the grounds of the school. One is Kamariotissa, the only remaining Byzantine church on the island, and more importantly the last church to be built before the conquest of Constantinople. The other is the grave of Edward Barton, the second English Ambassador to be sent to Constantinople by Elizabeth I of England, who spent his last days in Heybeli in order to escape the plague raging through the city in 1598. His remains were later relocated to the British Cemetery in the Haydarpaşa quarter of the Üsküdar district. To the right of the jetty lies the town with its bars and cafés, a hotel that stays open all year round, and many lovely Ottoman era wooden houses. At the top of the central mountain is an 11th-century Greek Orthodox monastery which houses the currently defunct Halki seminary, the main Greek Orthodox seminary in Turkey and Theological Seminary of the Ecumenical Patriarchate of Constantinople. In 1971, parts of the Private University Law were ruled unconstitutional by the Constitutional Court of Turkey; subsequently all private institutions of higher education either became part of the state universities or closed down. Halki's Board of Trustees refused to have it become a part of the University of Istanbul. Consequently, the seminary section of the Halki Theological School was closed down. The high school section is still open, but no longer has students. The monastery attracts tourists from all over Greece and Turkey. To prevent the island from becoming polluted, the only motorized vehicles permitted on the island are service vehicles (ambulance, fire, police, and the like), the only forms of transport are by foot, bicycle, horse and buggy and service transport. There is no airport; the only way of getting there is by boat. 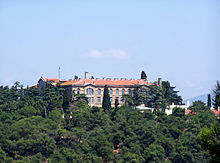 İsmet İnönü's house - second President of Turkey - is also located on Heybeliada and serves as a museum. The winter population of the island is around 3,000, but in the summer, the owners of the summer houses return and the population swells to approximately 10,000 people. The main attractions during the summer are small-scale open-air concerts laid on the local council, a swimming and fitness club next to the sea, and an annual Independence Day march which is commemorated by a resident naval band touring the island. TCG Heybeliada, the lead ship of the twelve Milgem class corvettes (first eight) and frigates (last four) that are being built for the Turkish Navy, is named after the island. The island was known as Halki, Halkitis (Greek: Χαλκίτις) and Demonesos (Δημόνησος) in antiquity. The first two toponyms derive from the Greek word halkos (Greek: χαλκός) for copper. The island was a famous source of copper and copper ores in antiquity. On one of the hills of the island, the monastery of Holy Trinity (Greek: ΜΟΝΗ ΑΓΙΑΣ ΤΡΙΑΔΟΣ) was founded by patriarch Photios I of Constantinople (9th c.). This was burned in the mid 16th century and again in 1831, and was finally reconstructed by patriarch Germanus IV of Constantinople in 1844. In the south-east of the island, a monastery of Saint George was founded by emperor John VIII Palaiologos (ruling from 1425 to 1448), later dedicated to Theotokos (Virgin Mary). After many destructive events, the monastery was rebuilt by Alexander Ypsilantis at the end of 18th century. In 19th and early 20th centuries it housed Greek schools, most notably the Halki seminary. Heybeliada (Prince island) / istanbul / Turkey, published in youtube.com on Jan 21, 2014, by Aydın Şevik. A tour of the island photos, greek title and legends, published in youtube.com on Apr 10, 2015 by Sokratis Bahlas. Wikimedia Commons has media related to Heybeliada. ^ Moges Xenophon, “The Greek School of Commerce in Halki” (Μογές Δ. Ξενοφών, Η εν Χάλκη Ελληνεμπορική Σχολή). Constantinople, 1875, pp. 18-64. In Greek.